After working in a corporate job for 3 years, I took one year off to travel abroad. It was during this time that I decided to switch careers and try my luck as a daytrader in New York. I wanted to be in the center of the action, where everything happened. Being in such a place increases your chance to meet the best traders in the world, learn with them and participate in the same events they attend. 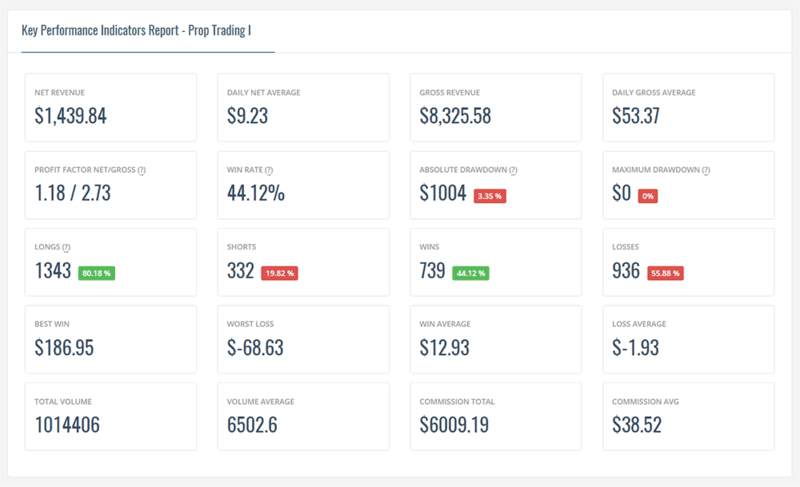 I made some contacts with a few prop firms and discovered that I could get all the infrastructure needed along with free training to become a professional daytrader. I packed my bags and went to NYC in September of 2006. Arriving there, I started filling out the account paperwork and was told that I needed to make a $30k deposit to start. Since I am a foreign, I could not start with the minimum deposit of $5k. I was really upset because back home, they told me I could open an account with 5k. I managed to fund my account with the amount necessary and moved along. In the first few days, I met my mentors and traders who were starting just like me. I got acquainted with all trading software and started to receive the first training sessions. In the same week, I had the opportunity to sit next to one of the mentors and owners of the firm to follow his trading. He made $2k in 40 minutes and sent hundreds of orders. I was shocked and excited for the opportunity to watch him make real money. I kept watching him for a few more days and finished my theoretical training. In the next week, I started to trade in the simulator, taking notes on my traders. At the end of the day, I would show what I did to my mentor for feedback. I did well in this step, just like everyone else who trades in simulators right. After 5 days, I started trading live. I decided to show my results to inspire people who wish to start their daytrading career. It is important to mention that my results don’t represent your results. People have their own learning curve, financial limits, psychological factors and even market conditions can influence the results that can vary drastically from trader to trader. My first month, I was down $297 as you can see in the image below. Note that I finished my first month in red, but I pulled money from the market. My gross pnl was $500. Another important factor is that when you start, your commission will eat a good chunk of your profits. In my case, I spent $800 in commission and taxes like sec, nasd, nyse and ecns fees. My mentor told me I did a good job. I had a negative month but positive gross. If my commission was low, I could have taken some money. I was happy with the results because I knew my commission would be drastically reduced as my volume grew. At the end of each day, I had some tasks to do. Besides talking to my mentor, I wrote in my trading journal. What I did, why I did, how I felt, what my thoughts were, reasons to get in and out of each trade and computed some performance metrics. 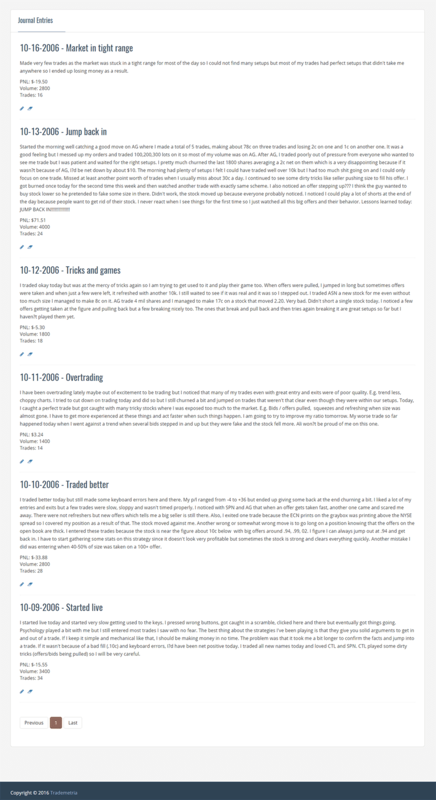 Below, you can see my first journal entries. Click to see all. At the end of the month, besides having training sessions and discussions among traders and mentors, we had to rank all our stocks to see which would be kept or removed. The task was simple. Keep the most profitable and remove the least ones. Check out how my stocks ranked. Watch how I made net profit in only 3 stocks that remained in my list. On the other end, the top 5 least profitable stocks were removed. This is a very important step for any trader to focus on stocks that bring you the most money, not stocks that you want or like to trade. As part of the process, we also needed to compute the avg net per trade. Sometimes, I didn’t delete stocks because of one or two big losses that were outside my control. Now, in my list, I lost 15 times on SVU, therefore there was no doubt that it had to be removed because I truly didn’t understand how it moved or traded. Sometimes the same stocks might appear again on your research and can be added again because market participants can change and the stock could become tradable. The next months were full of emotions that I’ll leave for a new post. Sometimes I went home imagining myself a millionaire and sometimes I wanted to jump from Queens bridge. My mentors were essential to keep me focused and any time I had a bad day, they worked my mind and let me watch them trade. They made between $1-5k daily with a few $10k days and a few small down days. I became profitable on March, 14th, a little more than 5 months to recover my losses. This balance does not include market data, platform costs and profit split. I don’t recall what my profit split was. Probably between 15-30% was taken from my profits monthly. An interesting number is my commissions and fees. Almost $7k. When you trade prop or scalp, commission is an important factor. Read my post: 11 differences between prop and retail traders. Below, you will find a chart where each plot represents my win rate and my average win rate (red line). It stabilizes after a few months to 44%. I had more losses than gains. The big difference was my risk management. I made more money when I won, than when I lost. This chart also helps you identify the health of your strategies. If your average is decreasing, it might be losing its efficiency and changes have to be made. Below, one more image of a few important metrics that really matter to any trader regardless of experience. My absolute drawdown was $1004, meaning I lost $1004 to become profitable, but it took me 8 months to make only $1439. In total, it took me 12 months to pay all my travel, housing and trading costs. What was the main element to reach profitability? My trading journal and deep trading analysis. If I had a win rate of 40%, I’d try 41% the next day. If my profit factor was 1.1, I tried to reach 1.2. I always asked myself why I lost, why I won. How I won. I made notes every day. All this helped me keep motivated and kept my eyes opened to what I was doing right and wrong. That’s why I created Trademetria. To help me and to help other traders achieve their objectives by understanding their trading results. Hopefully by now, you will have a better picture of how to become a daytrader, if you are considering daytrading as a career. Did you like this post? Tell me how you you are doing and subscribe to our newsletter by putting your e-mail in the lower left corner of the screen. Learn how to make more money using Trademetria. It costs less than $1 a day.